The origin of birds has always been a major problem for Darwinism, and even today little agreement about the evolution of birds exists. One of the most difficult issues related to bird evolution is the evolution of feathers. Feathers are complex, designed structures required for flight, and are today found only on birds. A literature review on the evolution of bird feathers showed that even though feathers are found back as far as the Cretaceous, including many well-preserved samples in amber, the fossil record reveals a complete absence of evidence for feather evolution. The implications of this major difficulty for Darwinism are discussed. These precision-designed structures are highly effective, yet extremely light, insulators that are designed to enable birds to fly. Bird wing feathers themselves are ‘one of the most beautifully designed structures in the world’.5 Feathers have such ‘striking diversity in size, shape, colours, and texture’ that very few human art masterpieces can compare with them in harmony of colours, liveliness and softness.4 Often copied but never equaled, the beauty in pattern and colours of feathers has been appreciated by humans the world over, as is evident from the fact that feathers have been used by humans to adorn themselves since ancient times. The black, brown and gray pigments in feathers come from the bird’s blood, and the red and yellow pigments from its fat. Lipochrome pigments produce red, orange and yellow colours, and melanin produces black, brown, red-brown and gray colours.6 The rainbow of colours on birds, including the blue shimmering on the throat and tail feathers, is due to both pigments and differential scattering of light. Referred to as structural colours, this method uses particles within the feather to scatter short wavelengths, because scattering intensity is proportional to the inverse fourth power of the wavelength. Also, microscopic ridges on the feathers act as a diffraction grating to break up the light that falls on them into all the colours of the light spectrum. These systems all combine to produce the vibrant rainbow of colours that birds commonly display. Their colours serve a variety of functions, including seemingly contradictory functions such as to attract mates and to blend in with their surroundings. The stunning array of colours is most apparent in the plumage of the peacock. Skin can be extremely thin, such as that covering many worms, of medium thickness, such as the skin covering humans, or thick and tough, such as the hide covering cows and elephants. Many animals also possess some type of hair growth in or over their skin or hide. Most mammals are abundantly covered with thick hair (fur) for warmth and insulation. Scales, such as those on reptiles, range from thin-but-strong scales covering snakes to thick iron-like scales protecting armadillos. Scales overlap like roof shingles and function in much the same way to keep water out and trap body heat while still allowing the animal to move. Feathers are a unique structure found only in birds. All birds (class Aves), and no other animals, have feathers.9 Feathers are considerably different from scales and all types of skin, whether the skin is thin and hairy, or thick and hairless. Feathers, scales, hair, fingernails and claws are all outgrowths of the skin, and are all as devoid of feeling as are animal hair or nails (for this reason, no pain is produced when hair is cut or nails are trimmed). Feathers and hair both form in pits called papillae located underneath the skin and often cover almost the entire body just as hair and scales do. Each pit is abundantly supplied with blood so as to nourish the growing feather. The feather, a strong-but-light structure, is constructed out of keratin, a strong-yet-flexible protein. Each parallel barb slants diagonally from the shaft, and has numerous smaller side branches or barbules (or webs) of different types that overlap those of the neighboring barbs in a herringbone pattern resembling a miniature replica of the whole feather.13 The flight feather of a large bird can have as many as a million barbules.14 The barbules in flying birds are held firmly to the next web by ‘hooklets’ called hamuli that function much like Velcro®. These branches and hamuli form a web sufficiently flexible, yet also stiff and dense enough so that when the bird flies, very little air or water is able to seep through the spaces.11 The branches and hooklets, in turn, contain barbicles. The feather barbules also must be strong, yet flexible enough so that they will not break in the wind. Their design enables birds to ride air currents more gracefully than the best glider human engineers have ever designed. If the hooklets are lacking, such as in the plumes of the ostrich, the bird cannot fly. Hooklets are designed so that they can separate under certain conditions, preventing wind damage to the wing and feathers, but can be easily reattached when the bird preens its feathers (ruffled feathers normally prompt preening behavior). Humans can repair a ruffled feather simply by drawing it between their fingers. Preening behavior is part of the irreducible complexity of the total feather design. For this reason ‘it is not realistic to discuss the evolution of the avian feather independently of the evolution of the avian integument with all of its interconnected features’.18 Evolution of feathers (or any of the many other structures required to fly) as separate structures is unlikely and clearly counterproductive because, as separate structures, they would impede survival. Special muscles on the skin enable birds to exercise detailed, controlled movement of their feathers. This system aids in flying, and sometimes in protection. Some birds fluff their feathers for various reasons, such as to give the appearance of more mass (to frighten enemies), to keep them warmer or to attract other birds during mating season. The famous feather spread of the male peacock is an excellent example of the high level of control that birds have over their feathers, as is their individual design.19 A further problem is that feathers are useless for flying (or most other functions) unless (and until) they are properly arranged on the bird. A clear pattern on the wing, tail and other parts of the bird is required. Over a dozen different kinds of feathers exist to achieve the many functions feathers serve, including not only flight but also signaling, courtship, waterproofing, streamlining the body, protective colourisation, insulation and even chemical defence.18 And none of these many kinds of feather variations leans in the direction of scales, as would be expected by Darwinists. Nor is there any evidence of transitional forms between any of the feather types. One of these variations is what is known as down feathers, where little or no shaft is present, and the barbs interlock far less often than in non-down feathers. Powder-down feathers are down feathers that release talc-like powder to help waterproof the feathers and provide them with metallic-like luster.6 Filoplume feathers contain hair-like projections on the end of each shaft that are used for decoration, courtship, sensory input and other purposes. In other types of feathers, such as the bristle feathers found on a flycatcher, the vein may be nearly or totally absent. Yet in other types, the vein may be solidified (such as on the penguin). 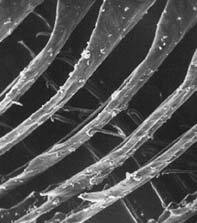 An electron micrograph of a flight feather. The hook of the barbules can clearly be seen. Preening ‘resets’ these hooks into the proper position. Courtesy David Menton. Yet another feather type is the flight or wing feathers (remiges), often called contour feathers, and tail feathers (rectrices) that function to help the bird guide its flight.9 Two basic types of flight feathers exist—fast and slow. The fast type are strong, trim feathers used in birds that travel at high speeds, such as pigeons and hawks. The slow type consists of a soft and loose-edged structure, and is used on birds such as owls that fly and soar at relatively slow speeds. Their advantage of slow feathers is that they produce flight that is far quieter than that allowed by fast feathers (quietness is far more important to an owl than speed). The common solution is to argue that feathers may have first evolved to provide insulation by a gradual increase in the size and the protofeather traits of scales.22 Known as the insulation theory, this idea has received a great deal of attention in recent years. In contrast to this hypothesis, Parkes argues if ‘the primary “need” of the avian ancestor’ was for ‘an epidermal outgrowth … useful as a thermoregulatory mechanism … why “bother inventing” anything as complex as a feather? Hair would have been much simpler!’26 Indeed, a hair-like structure is better for insulation, which explains why flightless birds have feathers superficially similar to hair.27 In some cases this can be explained by loss of information for the complexity of flight feathers due to loss of selection pressure to maintain aerodynamic structure,25 so is compatible with the creation model. Another problem that requires some explanation is the origin of the extremely complicated mechanism that birds use to avoid becoming overheated while in pursuit of their quarry. It is widely recognized that the heat-regulating mechanism of birds is poorly understood, and that no viable theory exists as to its origin. Problems include the fact that feathers reduce dissipation of the heat generated by the bird’s metabolism. Many theories exist to explain flight evolution, including the gradual elongation of scales to produce a large surface for parachuting, then gliding, and finally flight (the tree-down or arboreal hypothesis). Tarsitano et al. show that from a functional, morphological standpoint, the tree-down theory is superior, and that serious problems exist with the major opposing model.16 Other authorities argue for the opposite hypothesis, called the ground-up or cursorial theory. Yale University professor John Ostrom, after showing why the tree-down theory is fatally flawed, argued eloquently for the ground-up theory, a position that he admitted was a distinctly minority view.32 But as often happens, yesterday’s heresy is today’s orthodoxy, and now the cogent arguments by the arboreal advocates against the cursorial theory are largely ignored. The common assumption that birds do not preserve well because of their hollow bones is incorrect. They actually preserve very well in certain environments, especially lacustrine (lake) environments, inland water habitats and marine areas. As a result, bird fossils are common.36,37 A fairly abundant fossil record of both birds and feathers exists that enables us to draw some fairly firm conclusions about bird and feather history. Literally millions of impressions of a large variety of small animals—even insects and feathers—have been found in stone, clay, peat, tar and amber. The scales of dinosaurs and reptiles, the feathers of birds, the leaves of plants and even the wings of insects are all often clearly outlined in detail in the fossil record, enabling us to study these life forms in detail. Feathers also are preserved by carbonized traces (present in about 70% of deposits), bacterial autolithification (conversion to rock involving bacteria), imprintation (such as Archaeopteryx), in coprolites (animal dung), and in amber, among other methods.37 In general, the better the fossil record in terms of preserving morphology for a class of life, the weaker the case for Darwinism for that class. In the case of animals for which only bone fragments are preserved, such as those fossils used to support human and whale evolution, the ambiguity of the bones from extinct forms has been wishfully interpreted as evidence for transitional forms. The detailed structure of the feather (above) and scales (below) both magnified 80 times. Courtesy David Menton. Although no evidence exists for this primitive follicular structure in the abundant bird fossil record, Brush’s theory does demonstrate a major failure of current scale-to-feather evolution theories. Hair-to-feather evolution is actually the most logical theory for many reasons, including the fact that a hair follicle already exists. The major argument against this theory is that birds are speculated to have evolved from reptiles, not from mammals. Therefore, most all researchers have totally ignored the hair-to-feather theory. One of the oldest feathers, found in amber, dates back to the Cretaceous and is ‘an almost complete beautifully preserved’ feather. This example is a fully developed semiplume that is located at the margin of feather tracts and the apteria (the naked spaces between the feathered areas of birds) and usually is overlain by the contour feathers. The rachis and barbs were perfectly formed, and it sometimes is possible to identify the bird from which the amber-entombed feather has come. Unfortunately, many specimens have not yet been carefully studied. One that was identified was from a Pididae (woodpecker). Further studies no doubt will aid in the identification of many others. Although many fossil feathers and amber-preserved feathers (some dating back to the Cretaceous) have been located, no clues of feather evolution have ever been found in the fossil record—and consequently no physical evidence exists of the many changes that feathers must have undergone if they evolved. This was in the context of the fashionable theropod origin of birds, but it seems to an equally effective criticism of all reptile-to-bird origin theories. Other new discoveries—such as the hair like filamentous integumental appendages on Sinornithosaurus millenii, a non-avian dinosaur—have only complicated the Darwinian theory (such as discussed by Zhang and Zhou44). Although much speculation and major disagreements exist on how feathers ‘could have’ evolved, all existing theories are ‘just-so stories’, unsupported by fossil or historical evidence. The profound evolutionary enigma of feathers noted by Darwin76 and Heilmann77 remains, even today. The lack of evidence for feather evolution is not only a major problem for Darwinism, but the design and function of feathers provides evidence for both intelligent design and irreducible complexity. Flight and feathers are indeed a ‘miracle’.78 Feather evolution is related to the question of bird evolution. The latest discovery of feathers on the birdlike, turkey-sized ‘theropods’ Caudipteryx and Protarchaeopteryx indicate that they are flightless birds. Much debate exists about this and related finds.80 Some consider these animals to be birdlike dinosaurs, or other dinosaur-like, flightless birds that have lost their full flight plumage (or never developed it). Conclusions on these finds will require much more study, and yet already have produced much debate and controversy. Much disagreement still exists about Archaeopteryx, a discovery now around 150 years old. Likewise, the place in evolution, if any, of the recent finds may never be settled. Many of these finds are from a province of China, and already one find from this area has proven to be a hoax. Consequently, much more study is necessary to determine the value of these finds. So far, none of these finds challenges the conclusions presented in this paper, and early study of these finds has strongly supported the findings reviewed here. I wish to thank Clifford Lillo and Bert Thompson for reviewing an earlier draft of this paper. Parkes, K., Speculations on the origin of feathers, Living Bird 5:77–86, 1966; p. 77. Bishop, N., The Secrets of Animal Flight, Houghton Mifflin, Boston, p. 8, 1997. Witmer, L., The Search for the Origin of Birds, Franklin Watts, New York, p. 9, 1995. Prum, R.O. and Williamson, S., Theory of the growth and evolution of feather shape, J. Experimental Zoology (Molecular, Developmental, Evolution) 291:30–57, 2001. Compton, Comptons Encyclopedia, The University of Chicago, Chicago, Vol.4, 5:56, 1957. Hickman, C., Roberts, L. and Larson, A., Integrated Principles of Zoology, McGraw-Hill, New York, p. 588, 2001. Taylor, B., The Bird Atlas, Dorling Kindersley, New York, p. 5, 1993. Ogburn, C., The Adventure of Birds, William Morrow, New York, pp. 66–67, 1957. Bock, W.J., Explanatory history of the origin of feathers, American Zoology 40:478–485, 2000. Bishop, Ref. 2, p. 9. Bock, Ref. 9, p. 478. Terres, H., The Audubon Society Encyclopedia of North American Birds, Alfred A. Knopf, New York, 1980. Peterson, R.T., The Birds, Time, New York, 1963. Denton, M., Evolution: A Theory in Crisis, Adler and Adler, Bethesda, p. 202, 1986. Peterson, Ref. 13, p. 33. Tarsitano, S.F., Russell, A.P., Horne, F., Plummer C. and Millerchip, K., On the evolution of feathers from an aerodynamic and constructional view point, American Zoology 40:676–686, 2000. Prum, R.O., Development and evolutionary origin of feathers, J. Experimental Zoology (Molecular, Developmental, Evolution) 285:291–306; 292, 1999. Bock, Ref. 9, p. 479. 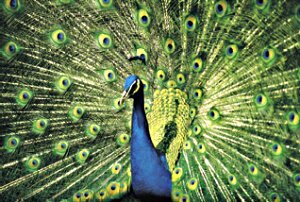 Burgess, S., The beauty of the peacock tail and the problems with the theory of sexual selection, TJ 15(2):94–102, 2001. Bock, Ref. 9, p. 480. Bock, Ref. 9, p. 483. Carroll, R., Patterns and Processes of Vertebrate Evolution, Cambridge University Press, New York, p. 314, 1997. Regal, P., The evolutionary origin of feathers, The Quarterly Review of Biology 50(1):35–66, 1975; pp. 35–36. Tucker, B.W., Functional evolutionary morphology: the evolution of bird; in: DeBear, G.R. (Ed. ), Evolution, Clarendon Press, Oxford, pp. 330–332, 1938. Ostrom, J.H., Archaeopteryx and the origin of flight, Quarterly Review of Biology 49(1):27–47, 1974. Parkes, Ref. 1, p. 81. Feduccia, A., The Origin and Evolution of Birds, 2nd Ed., Yale University Press, New Haven, p.130, 1999. Dewar, D., The Transformist Illusion, DeHoff, Murfeesboro, 1957. Bock, Ref. 9, p. 481. Bock, Ref. 9, p. 484. Regal, Ref. 23, p. 35. Ostrom, J.H., Bird flight: how did it begin? American Scientist 67:45–56, 1979. Carroll, Ref. 22, p. 314. Marden, J., How insects learned to fly, The Sciences 35(6):26–30, 1975; p. 27. Prum, Ref. 17, p. 292. Davis, P. and Dyke, G., Birds; in: The Encyclopedia of Paleontology, Fitzroy Dearborn, Chicago, p. 162, 1999. Davis, P. and Briggs, D., The fossilization of feathers, Geology 23(9):783–786, 1995. Denton, Ref. 14, p. 189; data compiled from Romer, A.S., Vertebrate Paleontology, 3rd Ed., University of Chicago Press, Chicago, pp. 347–396, 1966. Stahl, B.J., Vertebrate History: Problems in Evolution, Dover, New York, p. 350, 1985. Martin, L. and Czerkas, S.A., The fossil record of feather evolution in the Mesozoic, American Zoology 40:687–694, 2000; p. 687. Prum, Ref. 17, p. 291. Carroll, Ref. 22, p. 315. Cousins, F.W., The alleged evolution of birds; in: Patten, D. (Ed. ), A Symposium on Creation, Vol. III, Baker, Grand Rapids, Chapter 4, 1971. Zhang, F. and Zhou, Z., A primitive enantiornithine bird and the origin of feathers, Science 290:1955–1959, 2000; p. 1957. Brush, A.H., Evolving a protofeather and feather diversity, American Zoology 40:631–639, 2000; p. 632. Ostrom, Ref. 25, p. 27. Parkes, Ref. 1, p. 77. Pycraft, W.P., Animal Life: An Evolutionary Natural History, Vol. II—A History of Birds, Methuen, London, p.39, 1910. Martin and Czerkas, Ref. 40, p. 687. Osborn, H.F., The Origin and Evolution of Life, Charles Scribners, New York, p. 228, 1918. Maderson, P.F., On how an archosaurian scale might have given rise to an avian feather, American Naturalists 146:424–428, 1972. Pycraft, Ref. 48, p. 39. Maderson, P.F. and Alibardi, L., The development of the sauropsid integument: a contribution to the problem of the origin and evolution of feathers, American Zoology 40:513–529, 2000; p. 514. Denton, Ref. 14, p. 216. Klotz, J., Genes, Genesis and Evolution, Concordia, St. Louis, p. 460, 1970. Brush, Ref. 45, p. 631. Sawyer, R.H., Glenn, T., French, J.O., Mays, B., Shames, R.B., Barnes, Jr., G.L., Rhodes, W. and Ishikawa, Y., The expression of beta (ÃŸ) keratins in the epidermal appendages of reptiles and birds, American Zoology 40:530–539, 2000. Turner, C.E.A., Archaeopteryx, a bird: no link, Evolution Protest Movement, Sept. 1973. Bock, Ref. 9, p. 482. Chuong, C.-M., Patel, N., Lin, J., Jung, H.-S. and Widelitz, R.B., Sonic hedgehog signaling pathway in vertebrate epithelial appendage morphogenesis: perspectives in development and evolution, Cellular and Molecular Life Sciences 57:1672–1681, 2000. Carroll, Ref. 22, p. 306. Schmidt-Nielsen, K, How birds breathe, Scientific American, pp. 72–79, December 1971. Engineers make much use of this principle of counter-current exchange which is common in living organisms as well—see P.F. Scholander, The Wonderful Net, Scientific American, pp. 96–107, April 1957. Ruben, J.A., et al., Lung structure and ventilation in theropod dinosaurs and early birds, Science 278(5341):1267–1270, 1997. Dalton, R., Feathers fly over Chinese fossil birds legality and authenticity, Nature 403:689–690, 2000. Dalton, R., Chasing the dragons, Nature 406:930–932, 2000; p. 932. Sloan, C., Feathers for T. rex? National Geographic, pp. 98–107, Nov. 1999. Dalton, Ref. 66, pp. 689–690. Editorial, Disappearing discovery of the year: Archaeoraptor, Science 290:221, 2000. Brush, Ref. 45, p. 632. 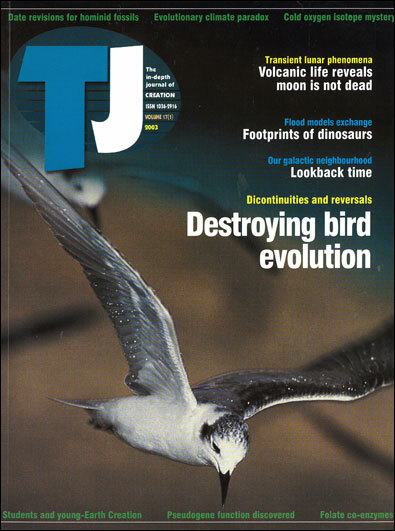 Rossmann, T., Feathered or furry dinosaurs, TJ 16(3):19, 2002. Padian, K., Dinosaurs and birds—an update, National Center for Science Education Reports 20(5):28–30, 2000; p. 30. Swisher, C.C., III, Wang, Y-q., Wang, X-l., Xu, X. and Wang, Y., Cretaceous age for the feathered dinosaurs of Liaoning, China, Nature 400:58–61, 1999. Woodmorappe, J., Bird evolution: discontinuities and reversals, TJ 17(1):88–94, 2003. Klotz, Ref. 55, p. 460. Darwin, C., The Origin of Species, John Murray, London, 1859. Heilmann, G., The Evolution of Birds, Witherby, London, 1926. Cromer, R., The Miracle of Flight, Doubleday & Company, Garden City, New York, 1968. Feduccia, A., Fossils and avian evolution, Nature 414:507–508, 2001; (with Mark A. Norell and Julia A. Clark replying on p. 508). Xu, X., Zhou, H-h. and Prum, R.O., Branched integumental structures in Sinornithosaurus and the origin of feathers, Nature 410:200–204, 2001. Stahl, Ref. 39, p. 349. Burgess, S. The beauty of the peacock tail and the problems with the theory of sexual selection, TJ 15(2):94–102, 2001.